Picture this: you’ve decided to throw a joint party for your twins or siblings born close together, or your child and her best friend. You’ll save money and planning time, and it’s double the celebration! The problem? One child is obsessed with dinosaurs, and the other wants a unicorn theme. Do you enter into hours of negotiations trying to get them to compromise, or pick a totally unrelated theme? Of course not! Double-themed parties are fun and easy. Don’t even try to make a ballerina/race car driver or space age/circus cake. Make or buy one smaller cake for each theme, so that both kids feel like it’s their special day. Design invitations that incorporate both themes. Devote one half to each theme, with a unique color scheme, each child’s name and the age he or she is turning. Pinterest has some great examples, like this “mermaid and shark” invite. One great idea for double-themed parties is to devote different rooms in your house to each theme. For example, you could have “under the sea” themed decorations and activities in the living room and a princess bash in the basement. Just make sure there’s adult supervision in each area, and bring the kids together for a few joint activities. Fun activities like pony rides, bounce houses and face painting complement any theme! Contact New Joy Entertainment for party entertainment everyone will love. 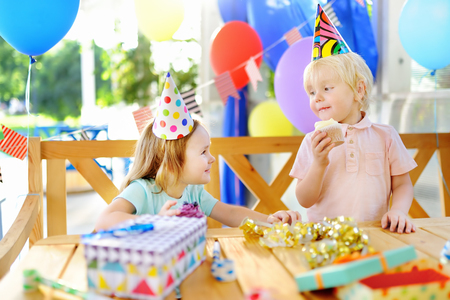 If you’re planning a celebration in the Tristate area, give us a call at 908-376-9375 to book your party date today!